NEW YORK (AP) — Facebook is spending $1 billion to buy the photo-sharing company Instagram. Instagram lets people apply filters to photos they snap with their mobile devices and share them with friends and strangers. Some of the filters make the photos look as if they've been taken in the 1970s or on Polaroid cameras. Facebook said it plans to keep Instagram running independently. That's a departure from its tendency to buy small startups and integrate the technology or shut them down altogether just so it can hire talented engineers and developers. Facebook is paying cash and stock for San Francisco-based Instagram and hiring its roughly 10 employees. The deal is expected to close by the end of June. Menlo Park, Calif.-based Facebook is expected to complete its initial public offering of stock next month. Getting Instagram is big win for Facebook as it works to harness people's growing obsession with their mobile devices and sharing every moment of their life. Instagram was only available Apple devices until recently. An app for Android devices was released last week. It's Facebook's largest acquisition to date. 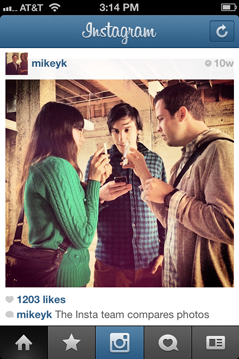 Instagram lets people apply filters to photos they snap with their mobile devices. Some of these make the photos look as if they've been taken in the 1970s or on Polaroid cameras. Facebook says it will keep Instagram running independently. Users will still be able to run it on rival social networks such as Twitter. That's a departure from Facebook's tendency to buy small startups and integrate the technology — or shut it down altogether. The payment will be in cash and Facebook stock. Facebook is expected to complete its initial public offering of stock next month. The deal is expected to close by the end of June. More from the San Jose Mercury News and NY Times.